I grew up in the Quad Cities (Bettendorf) and went to Wartburg College where I studied Math and Business with the goal of becoming an actuary. Right after graduation, I moved out to the Washington, DC area for a role in actuarial pension consulting. 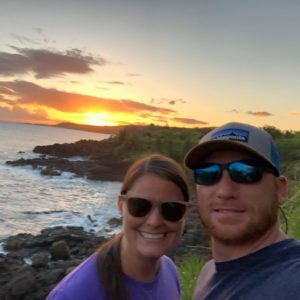 After a little over a year, my (now) husband and I decided we wanted to get back to Iowa and I ended up finding an actuarial position at Transamerica here in CR where we’ve been ever since – going on 10 years now! We’ve been married for just over 8 of those years and we’ve got two fur babies (beagles) at home. What is your favorite local food spot in the corridor ? You’ve got to get yourself ready for something big (think a big presentation at work, a day of skydiving, or handling a house full of kids without coffee). What do you do to get yourself pumped up up? I tend to have more energy if I get in a good workout – this also helps with nerves which I often have before a big presentation (and certainly would have if I were going skydiving!!). What is something that triggers happy memories? Music is definitely something that can bring back great memories for me. What is one of the best pieces of advice that you’ve ever received? A good friend of mine passed away of cancer last year after an over 3 year battle. Despite going through more emotional and physical challenges than I could ever imagine, she maintained her optimism and focused on being grateful for all the positive things she had in life like great family and friends. Whenever I find myself getting caught up in trivial things, I try to remind myself of her example to focus on being thankful for those things that really matter. What are you currently reading, listening to, or binge watching? Even though we’ve seen every episode I don’t want to know how many times, The Office is on pretty regularly at our house, even if just in the background. I’ve also lately been listening to the And That’s Why We Drink podcast when I’m out for a run.